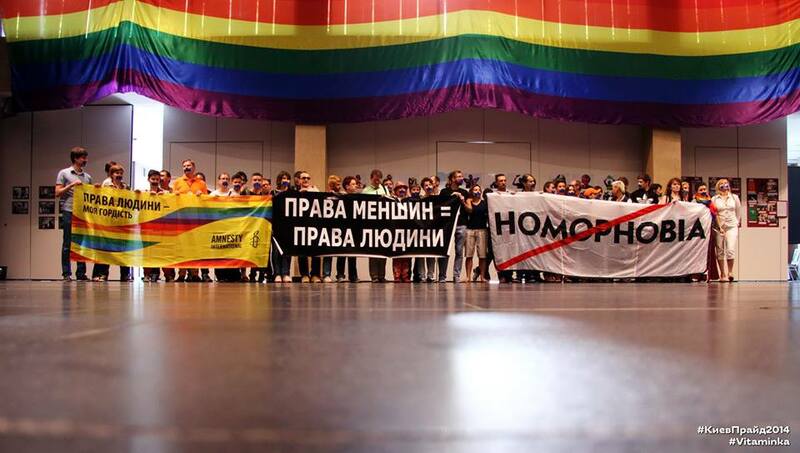 LGBT people played a key role in Ukraine’s Euromaidan revolution and were among the first to be targeted by Russian-led regimes in Crimea and Donetsk, where criminalization of LGBT people is now the rule of law. Coming all the way from Kyiv, human rights activist Anna Dovgopol will speak about the current situation of LGBT people in Ukraine. She will be joined in conversation by Ukrainian Canadian filmmaker Marusya Bociurkiw. The conversation will be intercut with excerpts from Marusya Bociurkiw’s latest documentary “This Is Gay Propaganda” and moderated by Ukraine expert Dr. Taras Koznarksy. Ukraine’s historic Euromaidan Revolution of 2013-14 brought together a diverse array of political, faith-based and activist communities. Among these was the LGBT community, a vibrant network drawn from over 40 LGBT centres, groups and NGOs across Ukraine. While the rainbow flag remained largely hidden for fear of harassment, LGBT activists were everywhere: working on the SOS hotline, standing guard in hospitals, fighting on the front lines. Marusya Bociurkiw’s latest film is a documentary short that follows the progress of the Euromaidan revolution, the Russian invasion and anti-gay laws that followed, from the perspective of LGBT Ukrainians. Interviewing queer refugees from Russian-occupied Donetsk, as well as LGBT activists from Kyiv, Kharkiv and Odessa, this film juxtaposes tragedy, creativity and celebration in its portrayal of eight activists struggling for the human rights of LGBT people across Ukraine and the former Soviet Bloc. Anna Dovgopol is a Gender Democracy Program Coordinator at Heinrich Boell Foundation in Kyiv, Ukraine, responsible for supporting LGBT/queer, feminist and gender initiatives. She is also a queer activist, and member of the Kyiv Pride organizing team. Marusya Bociurkiw is a filmmaker, author, and associate professor of media theory in RTA School of Media. She is director of The Studio for Media Activism and Critical Thought at Ryerson University. Dr. Bociurkiw’s media works and books about sexuality, Ukrainian ethnicity, food, and culture have been screened and read all over the world. This event is sponsored by The Studio for Media Activism & Critical Thought (Ryerson University), The Petro Jacyk Program for the Study of Ukraine (U of T), The Canadian Institute of Ukrainian Studies (University of Alberta) & The Department of Slavic Languages and Literatures(U of T).